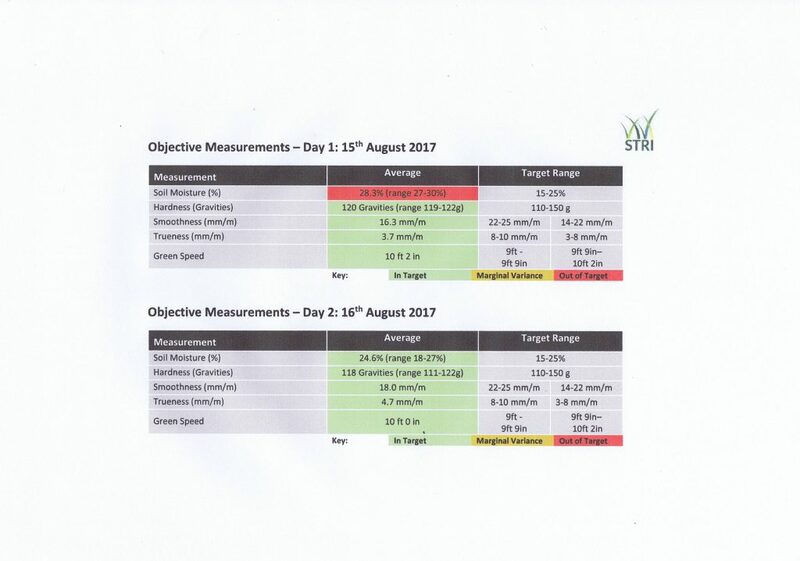 Recently we have had an R&A Agronomy visit from the STRI (Sports Turf Research Institute) to review the summer conditioning of the Championship Course and to take objective measurements of green performance. 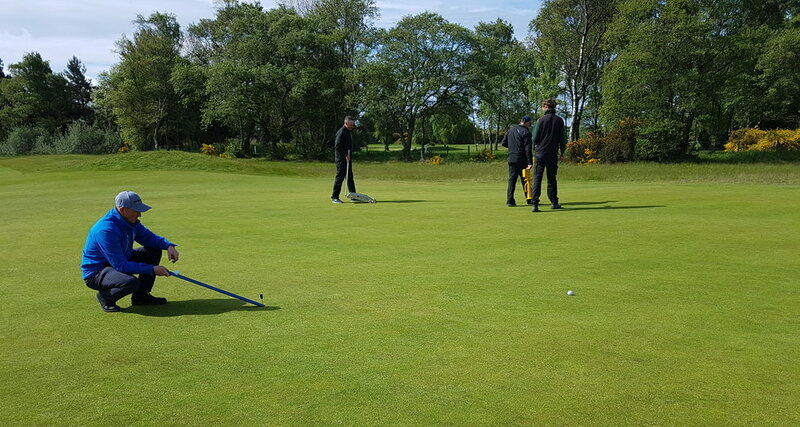 Our Agronomist, Richard Windows, along with his deputy, Adam Newton, met with Sandy Reid (Links Superintendent), Duncan Cairnie (Deputy Head Greenkeeper), Mark Reynolds (First Assistant) and myself for a two-day visit, including a course walk and two days testing greens. Deliver quality playing surfaces that meet the standard demanded for The Open. 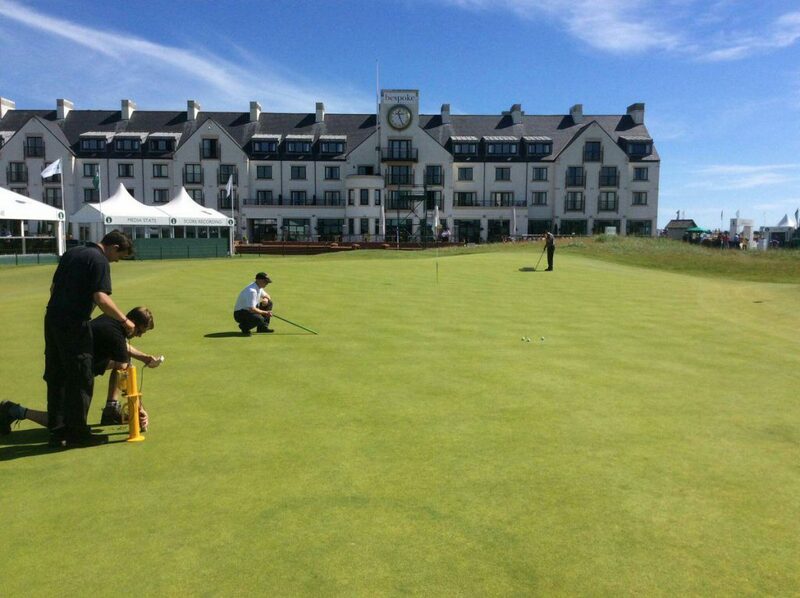 Provide objective data to inform the decision making in the build-up to and during The Open. 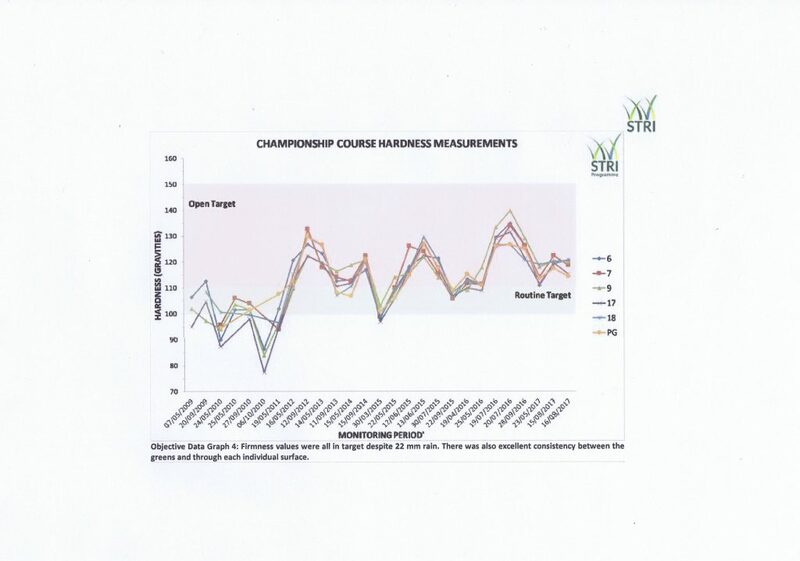 Visits incorporate the STRI Programme where performance measurements are taken to establish the current state of the course. The results form the basis for the development of a structured and targeted maintenance plan. This is measured using a device called a Clegg Impact Meter which calculates how firm the greens are. The Clegg consists of a compaction hammer operating within a vertical guide tube. When the hammer is released from a fixed height it falls through the tube and strikes the surface under test, decelerating at a rate determined by the stiffness of the material within the region of impact. This is measured in gravities and we are generally aiming for around 110-130 gravities. The levels of moisture are measured by inserting a probe into the surface which simply gauges the percentage of moisture present in the upper soil profile. Our target has been relaxed a little bit as before we were looking around 10-15% water moisture content, whereas now we are looking between 15-25% moisture. Our aim is to have a little bit more moisture in the profile without losing the firmness. Ball roll characteristics of putting surfaces is critical. The roll of a ball should be smooth and true and not negatively influenced by the immediate turf surface. The Trueness Meter accurately measures the smoothness and trueness of golf greens with the technology able to track the vertical and lateral movements of golf balls across the surface of the course. This enables us to measure surface quality and quantify improvements on the greens. Speed of the greens is measured with a Stimpmeter. The Stimpmeter is a 36‐inch long, aluminum tool designed to make a standard measurement of green speed. At one end is a ball release notch that is designed so that a golf ball will always be released and start to roll when the Stimpmeter is raised to an angle of approximately 20 degrees to horizontal. A Stimpmeter reading is a distance measurement in feet and inches. Green speed is determined by selecting a flat area of green, rolling a ball in one direction then in the opposite direction and averaging the two measurements. We can all get hung up on green speeds, a good green doesn’t need to be super-fast to be great. If all the measurements above are in target range, then there shouldn’t be any problem at achieving a nice putting surface. As you can see from the table and graph above, we are in a good place at the moment. A little bit high with moisture on the first day of testing but that was with 22mm of rain 24 hours before, while firmness stayed within The Open target range which is pleasing. Green speed was sitting around about the 10ft mark which is the speed that both the R&A and ourselves will be looking for them to be at throughout tournament days during The Open. Looking forward, we need to keep that consistency between greens as we head in to 2018 and of course in the lead up to The Open Championship.